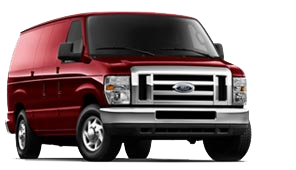 The Ford E-150 full-size van is available fueled with domestically produced, clean-burning propane autogas. The EPA- and CARB-certified ROUSH CleanTech 2012 – 2014 Ford E-150 cargo and passenger vans offer reduced greenhouse gas emissions without sacrificing performance and reliability. Maintains horsepower, torque, towing capacity and range while cutting your costs for maintenance and fuel. Fuel systems are available to buy for 2012 and newer model year Ford E-150 cargo and passenger van configurations equipped with the 5.4-liter V8 engine. These retrofit systems can be installed at any one of our ROUSH CleanTech authorized installation centers. Fleet managers can make hauling cargo or passengers less expensive and cleaner by driving a Ford E-150 propane autogas powered van. The 25-gallon fuel tank allows for exceptional range between refueling and is over 40 times more puncture resistant than a standard gasoline tank, making propane both a cost efficient and safe alternative fuel choice. For ordering information and price, please call or contact one of our authorized dealers. Switching to propane autogas not only benefits the environment, it also improves fleet operators’ bottom line. Fleet managers are discovering they can lower their fuel costs by 30 to 40 percent compared to gasoline, with less maintenance costs over time, by switching to propane autogas. Visit the Savings Calculator to see how much money you can save. Visit our Propane Page for more details on environmental benefits. Saving money and reducing harmful emissions does not mean sacrificing performance when it comes to the Ford E-150. You get the same horsepower, torque and towing capacity of a gasoline-powered Ford E-150, which is 225 horsepower and 286 lb-ft of torque. If you are in hot or cold weather, high or low altitude, snow or rain, you can depend on a Ford E-150 propane autogas van to start and operate consistently and reliably. ROUSH CleanTech maintains the factory Ford 5-year / 60,000 mile limited powertrain warranty on vehicles equipped with the liquid propane autogas system. The ROUSH CleanTech propane autogas fuel system is covered by a limited 1-year / 12,000 mile warranty when installed on a van that is no longer covered by the Ford factory warranty. The ROUSH CleanTech liquid propane autogas fuel system can be serviced using standard Ford diagnostic equipment, and service centers are being set up all around the country. Visit the Dealer Locator to locate a service center near you, or call . A number of government agencies and private companies have committed to sustainable strategies to reduce their emissions and carbon footprint. Fueling with propane autogas allows your company to have a measurable positive impact on the environment, gain corporate stewardship, and earn customer loyalty in the process. And with 90 percent of U.S. propane supplies produced here, you’ll be doing your part to help reduce our country’s dependence on imported oil. For more information on propane autogas fuel system engineering, visit our Knowledge Center.